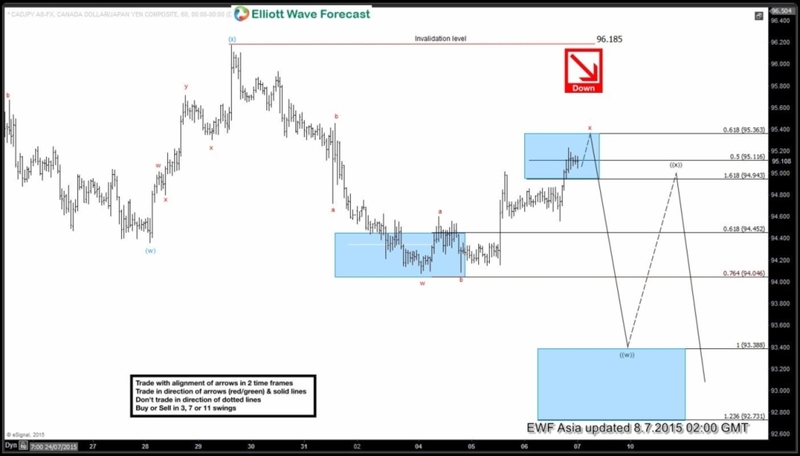 Short term Elliott Wave view suggests wave ((w) decline from 96.18 is in progress and taking the form of a double three wxy where wave w ended at 94.09. Wave x bounce is currently in progress as a FLAT, and there’s enough swing to call it complete, but a marginal high still can’t be ruled out towards 95.37. Once wave x is complete, the pair is expected to turn lower one more leg in wave y towards 92.74 – 93.4 equal leg area to complete wave ((w)). Alternatively, once wave x bounce is complete, the pair can pullback 50% retracement to correct the rally from 94.09 then go higher again in 7 swing to complete wave x bounce, but even in this alternate scenario, the bounce is still expected to fail below 96.18 for the next leg lower in wave ((w)) towards 92.74 – 93.4. From 92.74 – 93.4, the pair is expected to see a larger bounce in wave ((x)) before going lower again. We don’t like buying the proposed wave ((x)) bounce and expect the bounce to fail below 96.18 in 3, 7, or 11 swing and the pair to resume to new low.